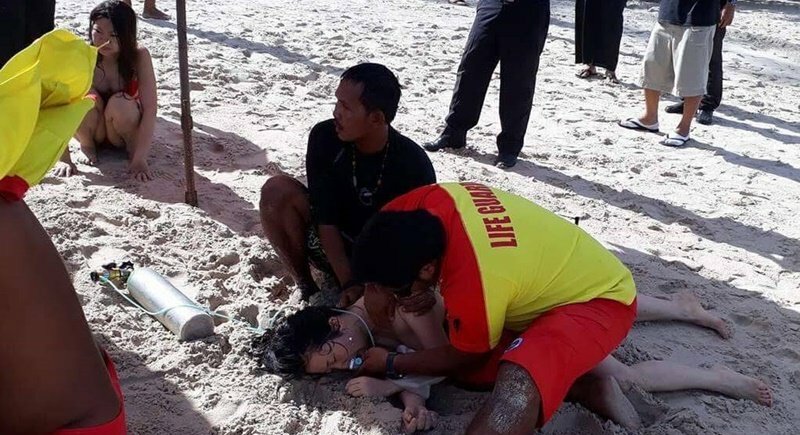 PHUKET: Three female Chinese tourists who ignored red flags and the warnings of lifeguard stationed at Patong Beach were saved from drowning by lifeguards this morning. The incident, which happened at 8:45am today (June 12), has left one of the females in a critical condition at Vachira Phuket Hospital*. Mr Somprasong Saengchard, the chief lifeguard for Patong Beach, said, “The incident happened at 8.45am while six Patong lifeguards were placing red flags along the beach. “Four Chinese females swam out to areas already marked with red flags so the lifeguards asked nearby boat operators, who were already in the water, to stop them from swimming due conditions on the beach,” he said. “However, the women still ignored the warnings and continued swimming until they got swept from the beach. “One of them managed to swim back towards the beach but the other three were either just floating or sinking,” he added. Videos and photos circulating on social media today show Patong lifeguards carrying out the rescue. One clip showed lifeguards performing CPR for the woman with severe symptoms whilst waiting for an ambulance from Patong Hospital. * Not Bangkok Hospital Phuket, as initially reported, The error is regretted.